Bolton Blinds are proud to give a lifetime warranty on all custom-made products in the folio range. All custom-made products are warrantied to be free from manufacturing defects in materials, mechanisms (cord locks and tilt gears) and components (brackets, wands, caps, etc. ), which make up the blinds or curtains. In the event a bolton blind is found to be defective in materials or workmanship, we will, at our discretion, repair, or replace the product, which fails to conform to this warranty. Please note that colour may vary from batch to batch on some styles, and that we periodically discontinue certain styles and colours. On discontinued items, we reserve the right to substitute warrantied product with the nearest colour or style of equivalent or greater value on current products. That said, we would make every effort to match current style and colour. In the event that warrantied product is not repairable, and cannot be replaced with the original style and colour (i.e. discontinued), it will be replaced free of charge with the closest available product. If you have matching blinds we will not replace all the blinds if just one is defective. The warranty is valid for Bolton Blinds manufactured products only. To obtain the warranty service, the purchaser must return damaged blind along with invoice or original sales receipt to the store they purchased from. This warranty does not cover any product, which fails due to accident, alteration, misuse, abuse, misapplication, improper handling, improper installation (if not fitted by dealer), and improper operation or cleaning. It excludes damage from animals or insects, normal wear and tear (common cosmetic issues related to extended use, including fraying, fading or discoloration due to prolonged sunlight, exposure or damage from salt air. Loss of pleating is not covered if the product is not being cycled (held in the raised position for a portion of the time). Wood and natural woven blinds are made from natural materials. As such, the following are to be considered as naturally inherent characteristics: variations in colour, grain and texture, natural markings (knots, mineral deposits, etc. ), minor bowing or warping of slats, reeds and natural materials. In addition, excessive warping of wood blinds or natural woven shades are excluded if installed in a high humidity area. This warranty does not cover cost associated with warranty service which includes, but is not limited to, transportation costs to and from our dealers, costs of removal, re-measure or reinstallation of product, or any incidental or consequential damages. Motors may have their own warranty and are not cover under this guarantee. If a product is replaced then the guarantee is not carried over to the new product. This warranty gives you specific legal rights and limitations, and you may have other rights by law. None of our employee has the authority to increase or alter the obligation of this warranty. This warranty is non-transferable. We also reserve the right to refund you the full value (at the time of purchase) of the product instead of a remake. To qualify for your lifetime guarantee then you must register your product online at www.boltonblinds.co.uk within 30 days of ordering. 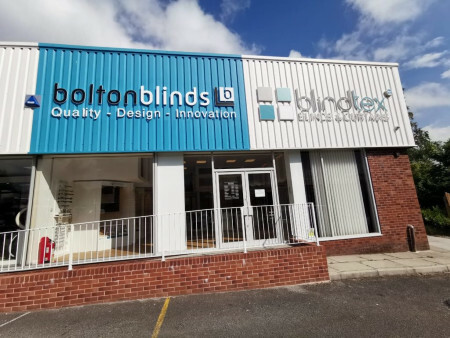 The UK’s biggest window blind showroom Here at Bolton Blinds we believe quality and service must come first, with a massive choice of window dressings such as our range of Venetian Blinds, Vertical Blinds, Roller Blinds and a colour range unrivalled in the trade.